ELENA is a trans-European cooperative project, involving partners from Germany, Hungary, Romania and Georgia, with the aim to promote nature awareness and responsibility. The Bavarian Academy for Nature Conservation and Landscape Management (ANL) is leading the project. The technical and educational approaches including in this project have already been tested in practice as part of the highly successful Bavarian model project “Tiere live": as part of this project, living animals are used in teaching and are cared for in part by students. The aim of the current project is to share this experience with our European neighbors, so that they made apply methods, develop activities and promote “Tiere live" internationally. The current project brochure offers you everything at a glance. How can responsibility for nature be taught sustainably? How can life experiences be passed on through lessons? And how can the successful transfer of responsibility be measured in during the course of a human life? These difficult research questions are tackled through the research project ELENA: Experiential learning and education for the support of nature awareness. Bavaria provides the know-how: methods of “Tiere live"
The Bavarian academy for Nature Conservation and Landscape Management (ANL) has taken on the guidance of the project as the lead partner and provides the technical and pedagogical basic information – acquired over more than ten years of experience with “Tiere live": Living animals are integrated into the school lessons and are supervised by the students themselves. Whether the animals are amphibians, snails, butterflies, hedgehogs, or more recently also chickens, the students generally enthusiastic when coming into direct contact with living animals, but also have the opportunity to overcome reservations and, finally, take responsibility for their charges. Guided by the accompanying folder to “Tiere live", with more than 15 animal chapters and more than 70 individual activities described in detail, a comprehensive collection of basic information is available for teachers for the implementation of activities. 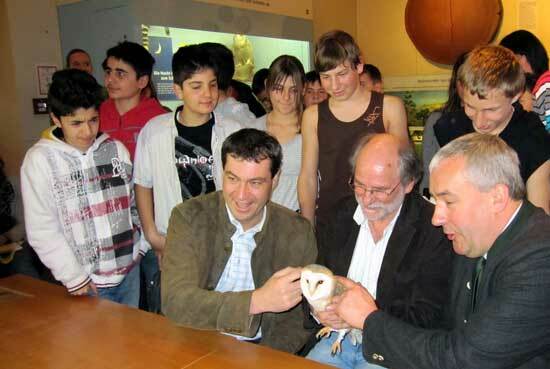 The project “Tiere live" was a strong, central contribution from Bavaria during the year of biodiversity 2010 and was promoted by both the former Bavarian State Ministry for Environment and Health and the Bavarian State Ministry of Education and Culture. The aim is to bring our experiences from “Tiere live" to the European neighboring countries of Hungary, Romania and Georgia for application and further development. The practical applications are scientifically monitored to analyze successes and potential challenges. During the trans-European comparison “Tiere live" is tested using the “acid test": new country-specific animal chapters can be written and put into practice. Science and practice are tightly interwoven. ELENA kick-off meeting: Participants from four nations consult on the beginning of ELENA. Although the European application steps have experienced significant challenges due to the financial crises, ELENA shows that transdiciplinary communication in Europe is alive and well and continues to grow. Scientists, practitioners and teachers at educational institutions in Germany, Hungary, Romania and Georgia are working hand in hand as part of the trans-European cooperative project, funded by the European Union within the program of Lifelong Learning/Comenius. The partners are renowned research institutions, schools and teacher training centers. In Hungary, the University of Szeged and the Rogers Foundation Budapest take part. In Romania, the University of Sibiu, the community school (Inspecturatul Scolar Judetean) and the gymnasium N21 – both from Sibiu – are involved. In Georgia, the organization Bird Conservation Georgia and the National Teacher Training Center of Tbilisi are involved. Germany is represented by the Bavarian Academy for Nature Conservation and Landscape Management (ANL), the Academy for Teacher Training in Dillingen and by the Rottmayr-Gymnasium in Laufen. ELENA celebrated its closing in Laufen, Germany October, 6th – 9th 2016. 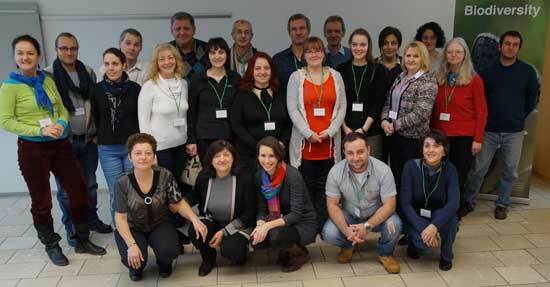 Practitioners, scientists, teachers and environmental educators from Hungary, Romania, Malta, the Netherlands, Georgia, Austria and Germany participated and helped the event to become a condign finale of ELENA. It was a beastly happening, since living animals were the focus, next to scientific and practical results. Ant farms and butterfly hotels were built, the gestures of a dog (or was it a wolf?) explained and living snakes were cuddled like puppies. 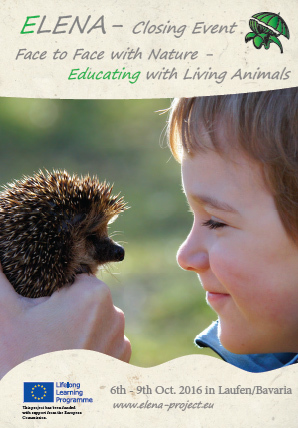 Everything concerning keeping, caring and benefits of animals in the classroom was communicated, just like the emotional access to nature conservation and biodiversity. 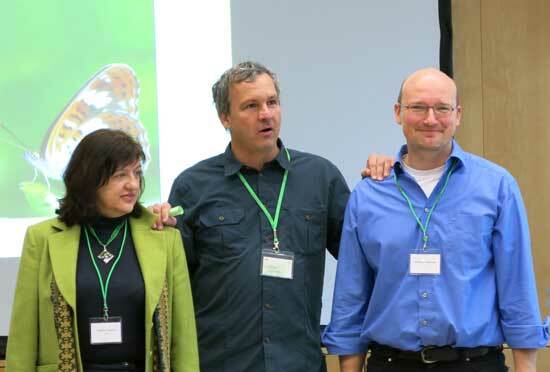 Leading scientists from the universities of Vienna, Hamburg, Brunswick and Regensburg attended the event and reported from their studies, how contact to animals can increase the pupils’ learning success and -motivation. 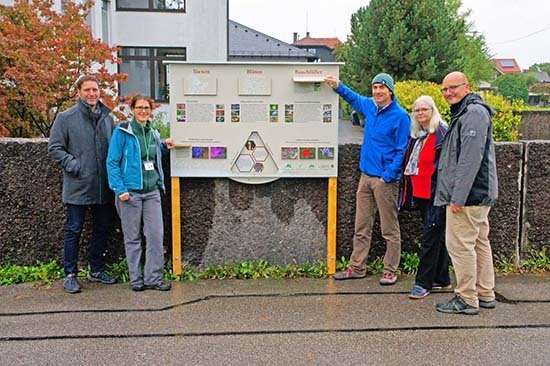 Another highlight was the presentation of a new information board on bees and pollination, that was placed in the school garden of the Rottmayr school in Laufen. It was developed in cooperation with the school, biosphere Berchtesgaden and the ANL as part of the ELENA closing event and can now be inspected by everyone interested. Fort he realization oft he information board, ANL, biosphere Berchtesgaden and the Rottmayr secondary school worked hand in hand: Peter Loreth, Elisabeth Brandstetter, Hans Bresina, Ute Künkele, Wolfram Adelmann (f.l.t.r) (Foto: Turoczi, ELENA). Even though the project was closed, it has for sure not ended yet: ELENA shall be spread and used furthermore, take place in many more class rooms all over Europe and sensitize children for environmental consciousness, species diversity and nature conservation – and of course it shall be fun! For the first time, the ANL was part of the IUCN World Conservation Congress and presented the results of the international project ELENA/Tiere live. 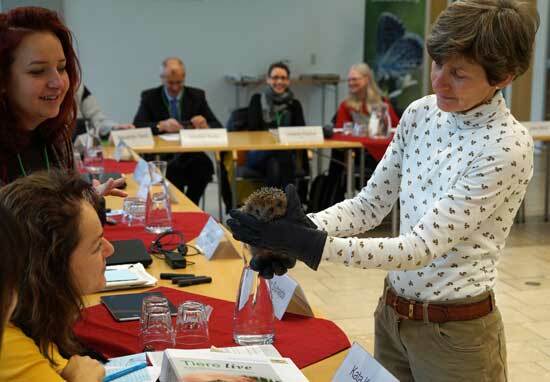 Furthermore it was possible to discuss the use of animals for environmental education in a “Knowledge café”. Besides discussion roundtable, the “#Natureforall Pavillion“ offered a game convent, where the English version of ECOGON was presented to the world public. We are especially happy to announce, that our colleague Mrs Katalin Czippan was voted Deputy Chair of the IUCN commission for education and communication (IUCN CEC). Mrs Czippan is going to coordinate and guide large parts environmental education work of the IUCN CEC.